With the first 2014 testing session underway this week at Jerez, the majority of F1 fans will be eager to hear the sound from these new 1.6 V6 turbo engines. This year will be one of the biggest changes to Formula 1 engine regulations in the history of the sport. The previous V8 2.4 litre engines were naturally aspirated and pierced your ears from its soundtrack and the introduction of turbo’s will be more of a growling sound, which will take some time getting used to. Each car for the 2014 season will have two less cylinders than the previous year resulting in 600bhp, and the introduction to a much more powerful energy recovery system (ERS) will not just harvest kinetic energy from braking (sound is completely different to previous years) but will also recover heat from the turbo’s turbine shaft and the exhaust gases. Unfortunately, it gives engineers and drivers two more acronyms to learn on top of the new turbos which will be nothing like the turbo’s of the past, and nobody knows exactly what’s going to happen. The electrical energy can be either directed to the kinetic energy (MGU-K as known to engineers) as extra power boost or to the battery for storage for later use. However, when acting as a generator, heat energy (MGU-H as known to engineers) is used to match the speed of the turbo to the engine and cut out turbo lag. The new ERS will produce 160bhp of the overall power (estimated to be around 760bhp combined), making it significantly more important to lap time than in previous years. The new engines represent a huge step into the total unknown, the first day at Jerez testing summed that up perfectly, with both Ferrari and Force India coming to a halt within matter of corners on their first voyage out of the pits. 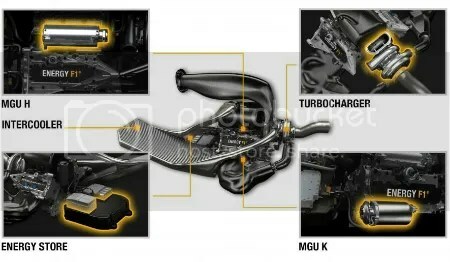 What we also don’t know is how the V6 combined with the turbo and the energy recover system will work on a full race distance, major concern among engineers will be the cooling of the turbo engine, especially with Red Bull who’s designer Adrian Newey is fond of tight exotic bodywork packaging around the rear of the car. Don’t be surprised if you see half of the grid not finish at the season opener at Australia. Drivers will now have to complete the same race distances as they did in 2013 but with just 100 litres of fuel, a rough estimation of 35% less fuel than 2013 and this will present a serious challenge for engineers and drivers in order for races not to become an economy run. The new engines will not use as much fuel for a start as they are smaller, while much more power is available from the ‘hybrid’ technology ERS. Race strategy will become even more important to ensure cars complete races. The ‘drive-ability’ and power delivery of the new units should prove a big challenge and watching how well the drivers and cars handle that extra power will be fascinating. Turbo engines produce significantly more torque than naturally aspirated engines, but the delivery of the torque can lag behind the application of the throttle, drivers have already commented that the throttle pedal should be a metre long to control the torque of the engine. One of the great challenges of the new power unit is to reduce turbo lag to near zero by using the heat recovery (MGU-H) to power the compressor while the turbo reaches full boost. Although the engines are smaller next season the cooling requirements are much higher with an intercooler for the turbocharger, plus extra cooling for the ERS system. All of these combined will not be welcome news for designers in the aero department where cooling means bigger radiators and bigger openings in the bodywork, one thing working for them is the bigger sidepods which have been introduced this year for safety reason (T-bones crashes). Many of you may be thinking that all these engines changes will be costing teams significantly more than previous years which is absolutely correct, but in the long run these systems will help reduce costs with fuel, aerodynamics, etc. and unlock technology which can be used in everyday motor engineering which will save billions. To sign off on one of the most exciting aspects of the 2014 regulations is that it shifts the emphasis ever so slightly away from aerodynamics. For the first time this decade engine departments will have the opportunity to innovate and compete with one another over the coming years. This post was written by Hiten Solanki who writes for Tempcover -day insurance.